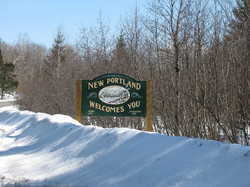 New Portland: Bridging the Past to the Future - Welcome to New Portland! Welcome to New Portland! Here at our site, you can explore many different historical artifacts. You will find a historical narrative, an exhibit on the history of the schools in New Portland, the New Portland Community Library history, and some information about the history of the 3 villages in New Portland.